AUZOLAN in Basque means "neighborhood work." Before there was a reliance on government, people had to take the initiative and make due on their own. Among Basques this took the form of neighbors periodically joining together to work on shared projects. 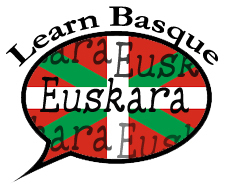 nabasque.eus is the website of the North American Basque Organizations, Inc.
N.A.B.O. is a federation of organizations for the promotion of Basque culture. Helping to make this website possible is the Basque Government of Euskadi. N.A.B.O. 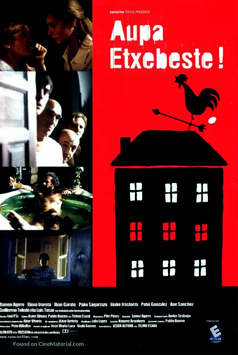 is a part of the global Basque Diaspora whose presence is online at www.euskaletxeak.net. 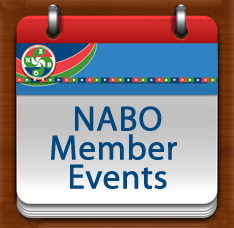 The success of NABO derives from the contributions of its member organizations. What does the Basque Government ask of Basque clubs? It is an often repeated inquiry: what does the Basque Government want of Basque clubs? In his address at the Basque Cultural Center of San Francisco (Feb. 2008), the President of the Basque Autonomous Government of Euskadi, Juan Jose Ibarretxe, laid out their three-fold aspirations. "And now let me speak to you about the future. On many occasions you ask us 'What does the Basque Government want from the Basque Centres?' Well, as Lehendakari [President of the Autonomous Basque Government of Euskadi] I would mention three challenges. The first is that your institutions become a social reference point in your communities; that the people in your community have a kind of health y envy of your co-existence and social projection. The more you grow both within your clubs and in your projection out to the world, the greater will become your recognition and social presence. Lehendakari Ibarretxe greeting NABO President Mary Gaztambide. He told her that he "wanted people in NABO to know that he appreciates the work that we are doing." And in this way, the Basque Country will obtain greater recognition in the international environments where Basque communities are to be found. For the second challenge, together with a show of solidarity between the Basque people, which is something that needs to be continually strengthened, I would concentrate on the young people of today, concentrate on their education, their preparation so that in as short a time as possible they can become the leaders of the Euskal Etxeak and the institutions in their communities. There is no future without youth. 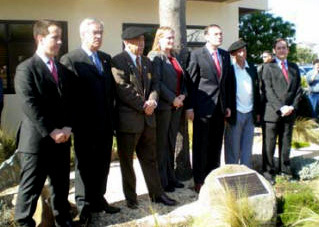 Lehendakari Ibarretxe and other dignataries standing in front of a seedling of the Tree of Gernika at the Basque Cultural Center in San Francisco. And finally for the third challenge, I would ask the youngsters to build a new world, both in the Euskal Etxeak and in their community. In July last year, the 4th Conference of Basque Communities was held. 50% of the participants were youngsters. And the motto of the Conference was ZUBIGINTZAN, building bridges. You are the bridge between your parent's generation--gurasoak--and your children's--seme-alabak--you are lodged between the past generation and the next. But bear in mind that a bridge means meeting, union, mutual relations and projection. Under no circumstances does it involve separation, disagreement, break-up. From this perspective, it would be interesting if in the 2011 Conference you could present the objectives that were set during the previous Conference on recovering the historical memory of Basque presence throughout the world and especially in America. It is important to know where we come from: it is important to quench our thirst at the fountain of knowledge of our origins, our past history and the why and the wherefore of our Euskal Etxeak. But if it is important to recover historical memory, the challenge of your projection and the projection of your Euskal Etxeak into the future is by no means less important. Don't be afraid of change, of the new realities that will crop up in your path. You will never be able to resolve the problems of new situations with past strategies. But even though this is true, never forget that the life of institutions depends upon whether we get it right when setting up a community. We should built a society where everyone feels at home and where everyone, both young and old, perceives the Euskal Etxea as their own institution. In the Basque Government we firmly believe in the philosophy implied in the motto ZUBIGINTZAN-building bridges: the work carried out by you and your ancestors has given the Basque people and their representatives a positive international image. And so I want to take this opportunity to thank you from the heart, to say to you quite clearly: Eskerrik asko bihotz-bihotzez."